I have written a few posts (The rationality of the strange past, Strange cover and Strange Histories) about Darren Oldridge's book Strange Histories, and I have mentioned that Oldridge refers to the Medvedja vampire case from 1732. 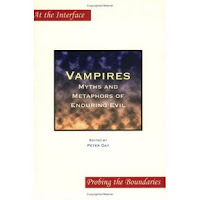 He elaborates a bit on this subject in his contribution to an anthology called Vampires: Myths and Metaphors of Enduring Evil edited by Peter Day and published by Rodopi, Amsterdam, in 2006. The text is pretty short, just 11 pages, and is entitled "Dead Man Walking": The Historical Context of Vampire Beliefs. Here Oldridge again discusses the historical construction of belief, as he asks the question: "If perfectly rational, well-educated people could accept the existence of roaming corpses three hundred years ago, why is the same idea inconceivable today?" To answer this question, he borrows the concept of a system of belief from the antropologist Clifford Geertz: "the framework of beliefs, expressive symbols, and values in terms of which individuals define their world, express their feelings, and make their judgments." 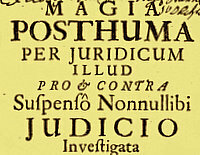 As a system of belief constitutes the framework within which the facts of the world are perceived, and as it also changes over time, our concept of rationality and "common sense" will change depending on our "historically defined standards of judgments." Oldridge gives a number of examples and also shows how certain phenomena can be either interpreted within a framework where the existence of revenants is accepted or within the framework of scientific medicine, where they are not. As for our own 21st century system of belief, Oldridge puts it like this: "We live in a culture that does not permit corpses to stir; and this basic assumption has condemned vampires to the realm of fiction." I'm pretty surprised to find that Oldridge states that in the Medvedja vampire case, "the doctors concluded that several of the bodies [of suspected vampires] posed a threat to the living," as I don't remember a statement of this kind in the Visum & Repertum report. The military doctors (if we can call them doctors?) were certainly surprised by the apparently uncorrupted state of the bodies, but in my opinion they did not agree with the local people on the reality of the revenants. "The point of these observations is not to 'explain away' vampire beliefs in terms of modern science. On the contrary, it is to suggest that prior assumptions often determine our understanding of what we see. (...) In a world that believes in demons, 'the hag' presents clear evidence of their power; in a society that does not, it needs to be explained in terms of other acceptable ideas, such as the psychology of sleep disorders. The social construction of belief is most obvious when we step outside our own culture." The book contains a couple of other contributions that may be of interest to readers of this blog, in particular Peter Mario Kreuter's The Name of the Vampire: Some Reflections on Current Linguistic Theories on the Etymology of the Word Vampire. There is also a nice and short overview of the genesis of Bram Stoker's Dracula by Elizabeth Miller. I couldn't resist showing the above scene from Mario Bava's Italian horror film Operazione paura from 1966 (in English known under various titles like Curse of the Living Dead and Kill Baby Kill). Curiosly, in this film the local people do not want the bodies of the dead disinterred, in fact, they don't even want to discuss the subject for fear of the revenant of a little girl that haunts the place. As you can see, the authorities and men of modernity, including the doctor at the left who has been called upon to examine the bodies, discuss the system of belief of the local people. As outsiders they meet the local people in a way similar to how we read the 'strange histories' of the past, but as it goes, the good doctor can not escape the terrifying 'system of belief' that determines how the local people live and act.